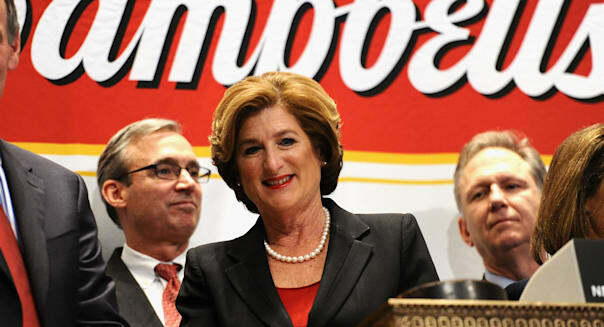 Andrew Toth/Getty ImagesDenise Morrison, president and CEO of Campbell Soup, rings the closing bell last month to commemorate the company's 60th anniversary of listing with the New York Stock Exchange. Campbell Soup (CPB) said it would reorganize its business into product divisions, instead of geographies or brand groups, as it focuses on growth areas in the face of cooling soup sales. The company said the reorganization would shift its "center of gravity," a reference to its troubled soup business that has managed to boost sales only twice in the past five quarters. The world's largest soup maker said it would now have three divisions -- Americas simple meals and beverages, global biscuits and snacks, and packaged fresh products, which include seasoned baby carrots. Currently, the company has five divisions. Weak sales prompted Chief Executive Officer Denise Morrison to launch a turnaround program after taking office in 2011, spending hundreds of millions of dollars to revamp the company's marketing and packaging strategies. Products under development include "to-go" soups that could be made in a Keurig Green Mountain (GMCR) coffee machine. The company also acquired or developed a slew of brands and products such as puffed Goldfish snacks and Bolthouse Farms, a producer of fresh carrots and beverages. The turnaround efforts have yet to bear fruit on a sustained basis, however. Increasing competition from store brands, private labels and niche producers such as Pacific of Oregon, Harris Foods and Amy's Kitchen, have also hurt the company's soup business. Thursday's reorganization will make the company more streamlined and simplified, Campbell said. Campbell's shares were little changed at $45.73 in early trading on the New York Stock Exchange. The company is scheduled to report second-quarter results on Feb. 25.